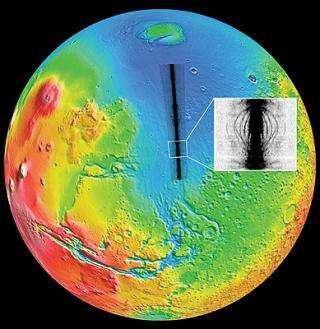 Scientists are finding an older, craggier face of Mars buried beneath the surface, thanks to pioneering sounding radar co-sponsored by NASA aboard the European Space Agency's Mars Express spacecraft. In a paper published in the Dec. 14 issue of the journal Nature, researchers say radar echoes captured by the MARSIS (Mars Advanced Radar for Subsurface and Ionospheric Sounding) instrument strongly suggest there are ancient impact basins buried beneath the lowland smooth plains of the Martian northern hemisphere. The MARSIS instrument transmits radio waves that pass through the Martian surface and bounce off of features in the subsurface that have a contrast in electrical properties with the materials that buried them. Martian lowland crust was buried first by vast amounts of volcanic lava and then by sediments carried by episodic flood waters and wind.